Since it came into being in 1983, QGE has executed a vast array of major projects successfully earning its spurs as a construction firm, and now it is an acclaimed name in the industry. Our diverse portfolio encompasses the sectors of high-rise developments, residential, commercial and industrial, hotels, airport developments, stadiums, villa communities, mixed developments, entertainment and offshore oil and gas installations. QGE conflates a thrust on outstanding construction with a dedication to superior client service. By heeding to the clients what they want and adapting our skills to meet with the desired result, we prove that we’ve got the ability to understand and implement fully the scope of any project. With an integration of our skilled workforce, state-of-the-art plants and equipments, we’re capable of handling a project of far magnitude and complication. Decorative Natural Stone Wall Finish from Burlite Ltd. (UK.) - Consists of natural aggregates including granite, mica and glass combined with non-toxic specially blended cementitius matrix containing special additives; and a BS EN ISO 9001 certified. Suspended Ceiling - Metal, Aluminum, Steel Tiles and Strips, drywall partition system, steel doors and fire resist doors from RAM Metal Industries (UAE). Acoustics Panels by Heraklith AG (Austria) and Knauf (France) - the product line that is ideally suited for both noise and reverberation control. Panels are made up of wood wool and caustic magnesite as binding agent; and suitable for multi-purpose hall, broadcasting studios and heat resistant insulation. Ceramic and Mosaic Tiles from various companies in Italy, Spain and France which comes in various sizes and wide range of special designs, motifs, colours and special pieces for residential, swimming pool, public/private construction, industrial/ manufacturing buildings and etc. Special heavy traffic floor tiles suitable for indoor and outdoor areas. Swimming pool tiles along with special matching pieces appropriate for the tiling of every type of pool side, non-slip tiles for the areas around the swimming pool and other facilities. Computer design glass mosaic wall tiles with motif. Indoor and Outdoor Light fittings from various companies in Europe and to name some, CU Phosco Lighting (UK), Eclatec (France), Eurolight (Italy), and etc. Sports Flooring from Bolidt (The Netherlands) one of the largest supplier of sports equipment from which comply with the requirement. Sports Equipment from SPORT FRANCE (France) one of the largest supplier of sports equipment from which comply with the requirement of the client for all quantities. Al Meer Productions develops new geographies to make the animation community as global as can be. Al Meer Productions are involved in distribution of films and videos in the Middle East. Al Meer Productions seeks to distribute documentary and fiction films (narrative features and shorts), offering producers full service distribution in all markets, including educational, non-theatrical, theatrical, television, cable, internet, and home video. Almeer Productions has leveraged its strong studio and industry relationships to execute both the sale and acquisition of content rights for its clients. By maximizing the close relationship that it enjoys within Middle East, Al Meer Productions provides properties and imported foreign properties in the Middle East with powerful licensing and merchandising programs supported by a comprehensive blend of carefully chosen media support. Is to be preeminent CG animation producers and to develop quality properties and to offer superior outsourcing services across all major formats of the entertainment industry, primarily feature films, DVD, television and interactive gaming. we take pride in forming an inextricable relationship with our clients, which fosters a partnership of creative progress and execution. 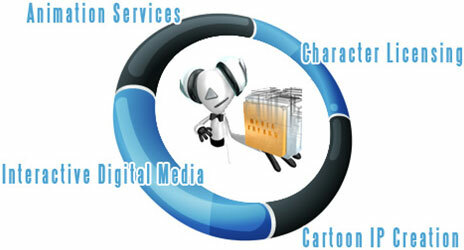 Animation Services - Providing high quality 2D & 3D animation solutions to broadcasters, marketers and producers. IP (Intellectual Property) Creation - Creating appealing cartoon content for distribution into the international market. Interactive Digital Media - Creating innovative web and mobile applications for mass marketing and monetizing. Character Licensing - Licensing cartoon characters to 3rd parties for mutually beneficial partnerships. Disitribution - Distribution services for producers and rights holders of 3D & 2D Animation content, Japanese Anime, Music, Documentary, film and television content by leveraging its knowledge and relationships in the industry to maximize all potential revenue streams from both traditional broadcasting services as well as all new media delivery platforms. Acquisitions - Acquire distribution rights to film and television content for traditional broadcasting and new media platforms from producers and content rights holders for both the Middle East as well as all major international territories. Production - Production of film and television content from financing to developing and distributing. Business Development - Work with clients to develop new business strategies for the distribution of content whether it be new traditional broadcast services or VOD and online strategies. Film Restoration & Archiving - Motion picture and Movies capture history and culture of a country and present as a form of entertainment. Many movies made in 1930’s to 1960’s have been lost due to acts of nature and the rest are slowly degrading due to environmental conditions like high humidity, moisture, poor storage conditions and neglect. Film Restoration is the process of repairing damaged films, whether in celluloid film or video tape, both by physical and digital restoration technology and presenting a pristine restored sequence of images in any media format. Film Colorization - Giving a fresh life to the Black and White Period. Bring the Black and White movies and motion capture to its original colors. Corporate Walk Through - We create 3D Architectural Walkthroughs that really drive business, even before, you start the construction of your project. Designed walkthroughs serves multidimensional usage and can be used for a variety of business promotional programs. Internet & Web Solutions - We design not just another website but strong W3C based standards online presence that ensures business results. Solution that carries various information and services, such as electronic mail, online chat, file transfer, interlinked web pages and other resources of the World Wide Web. Right from news across the corner of the world, wealth of knowledge to shopping, purchasing the tickets of your favorite movie-everything is at your fingertips. At AL MEER PRODUCTIONS we believe that animation is simply a medium, and the factual benefits of animation come across by harnessing it as a powerful marketing tool and using cartoon characters to create striking and innovative merchandise. Our business model is built around cartoon animated series and movies, character licensing, interactive online portals, interactive mobile products, virtual worlds for kids and more. All our projects are established based on two main criteria- Potential profits and Reach to masses. A contracting company currently involve in the construction of 38 villa compound in Umm Salal Mohammed, Qatar. Underground Infrastructure Projects with best of the German technology. Nasser Ahmad Mohamed Almeer Group having been verified as one of the most reputable contracting company in the State of Qatar.